After spending the night right outside of Eugene, OR I woke up early the next morning and started making my way towards the Coos Bay airport. 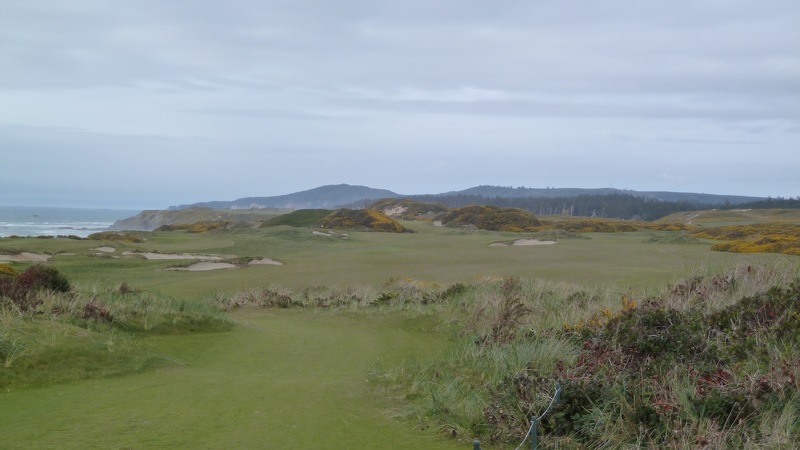 I was going to drop off my rental car there and meet up with the contingent of Texas guys I was joining for the Bandon Dunes portion of my Pacific Northwest trip. It’s about a two and a half hour drive from Eugene to Coos Bay so I had plenty of time before their flight from San Francisco arrived in the early afternoon and I could make a leisurely morning out of it. My GPS gave me a number of options for getting from Eugene to Coos Bay and on my buddy Barry’s recommendation I decided to take the coastal route that heads directly west towards Florence and then south along the coast from there. While there are not a ton of ocean views, the coastal route is very pleasant and winds through some beautiful forests with the occasional ocean vista through the trees or at a roadside scenic overlook. As far as I’m concerned it beats the heck out of highway driving. 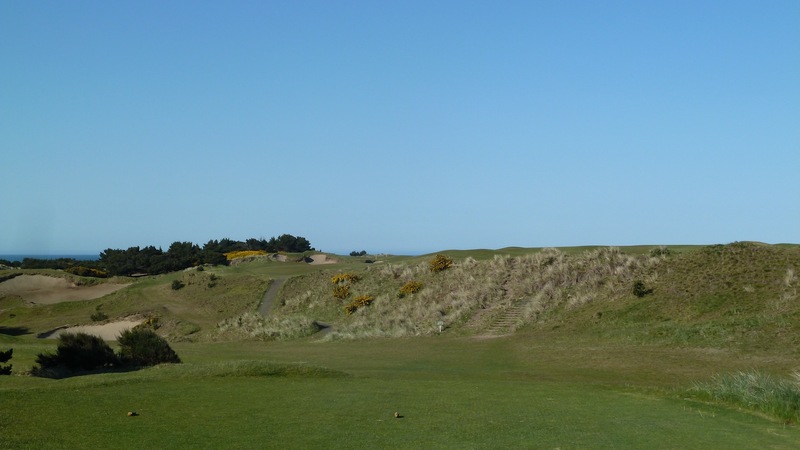 Once the guys coming in from San Francisco arrived we loaded our gear into the shuttle that would take us to Bandon Dunes Golf Resort and we were on our way. After a quick stop at the main lodge to check into our rooms at the Chrome Lake Lodges we got changed and headed to Pacific Dunes to officially kick off our four and a half day visit. 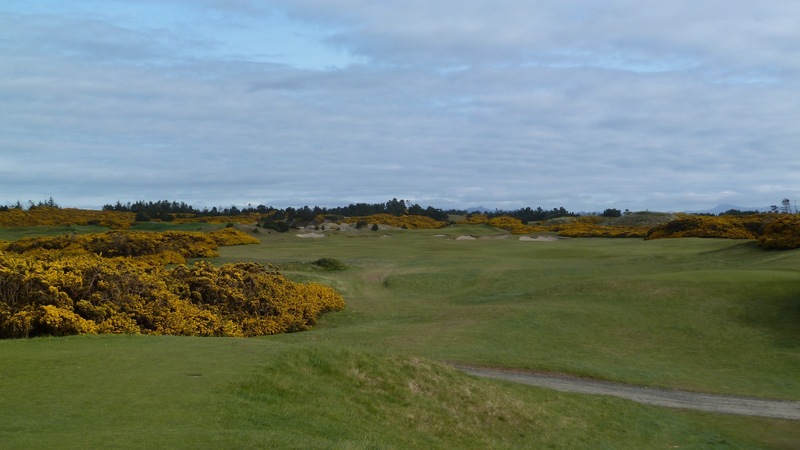 In 2010 when I visited Bandon Dunes it rained on us during nearly every round and I was not able to take very many photos at all, but luckily the Golf Gods smiled on me for this trip and our weather was spectacular. 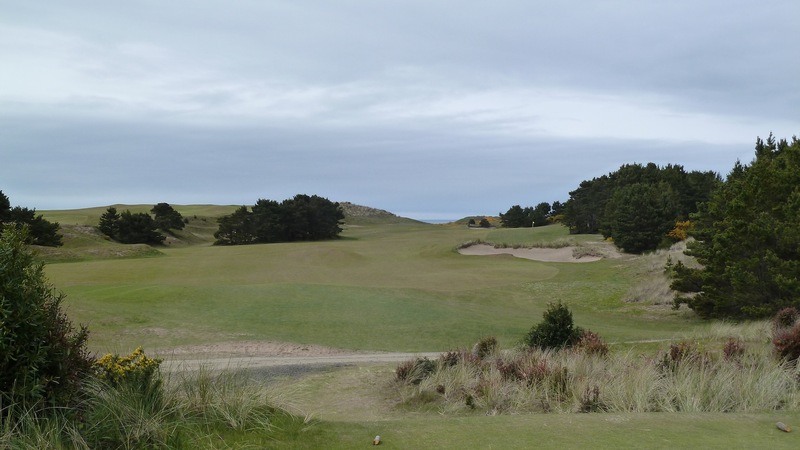 The photos below were taken over the course of two rounds and were all taken from the green tees which play 6,142 yards. 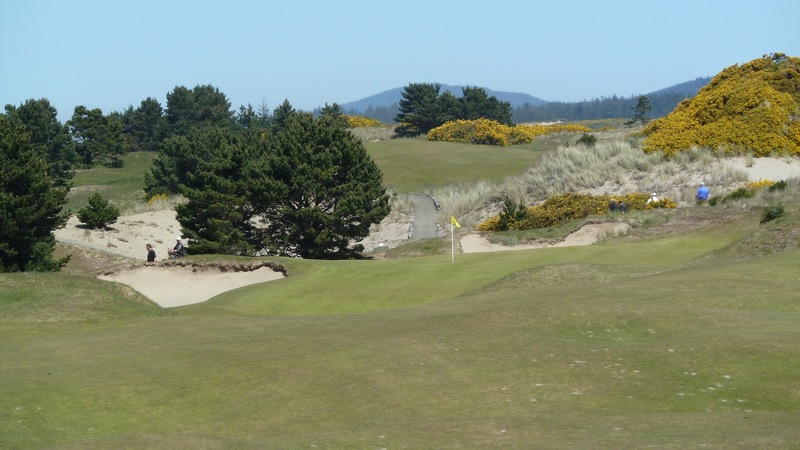 The opening shot at Pacific Dunes is to a blind landing area and does not require a driver. A 200-220 yard hybrid down the left side of the fairway will provide the best angle into the green. Here is a look at the approach shot. A slightly closer look at the green. 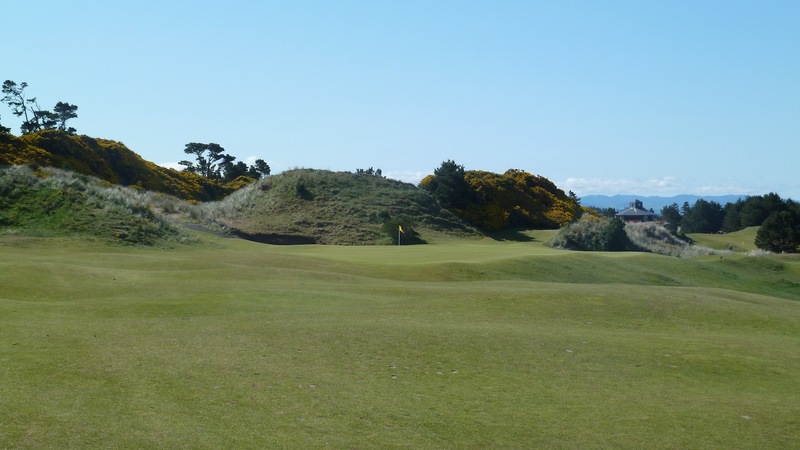 Here we have another short par 4, but don’t be fooled by the numbers on the scorecard. 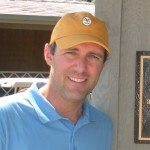 The wind will play a major factor in shortening or lengthening a hole. The bunker in the middle of the fairway is definitely in play. Here we have a look at the approach into the 2nd green. 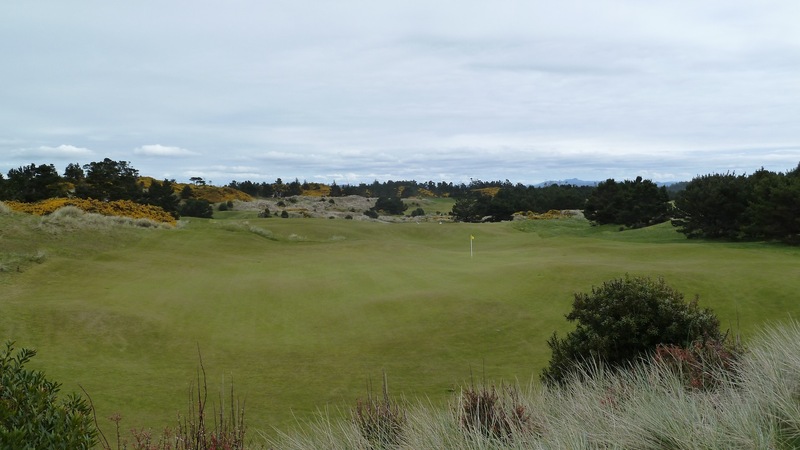 This photos shows some of the contours of Pacific Dunes’ greens. Here is where the course starts to head out towards the water and the winds can really begin to pick up. The fairway bunkers are in play from the tee. A view of the approach shot into the green. The bunkers on the left side of the green can be a tricky up and down. 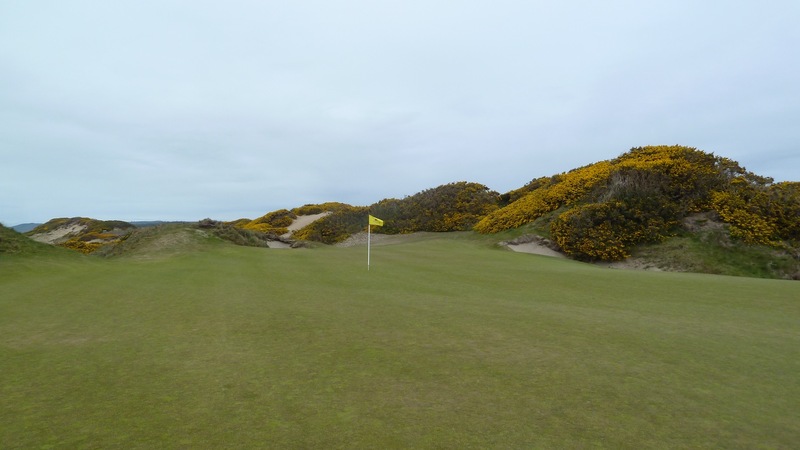 Here is a view of the putting surface surrounded by gorse covered dunes. 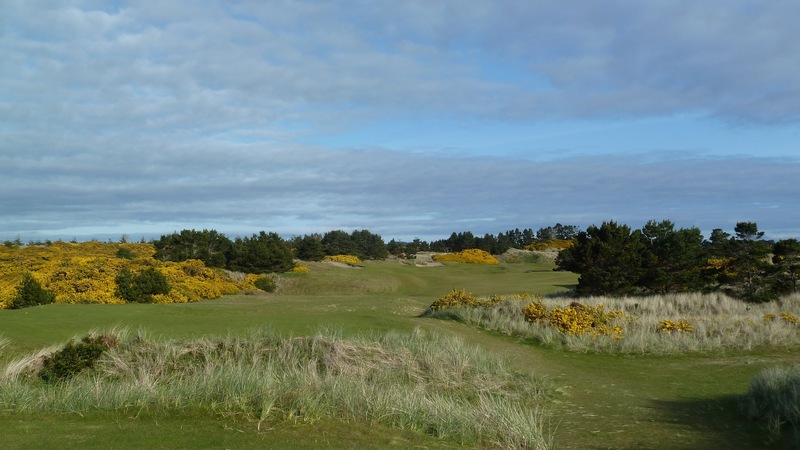 Note that the gorse is in full bloom with its yellow flowers. This hole is a beast when it plays into the wind. 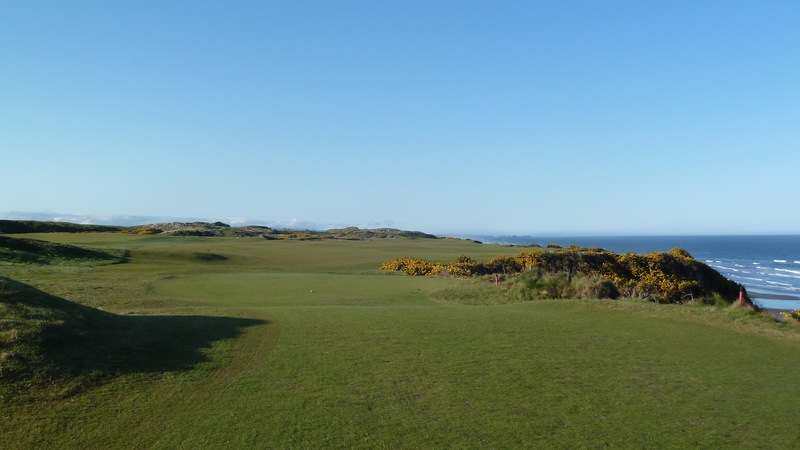 The common miss is to the left, but there is much more fairway on the right side than there appears to be. Here we have the first of five one shot holes on the course. There is room to miss in the front of this green. 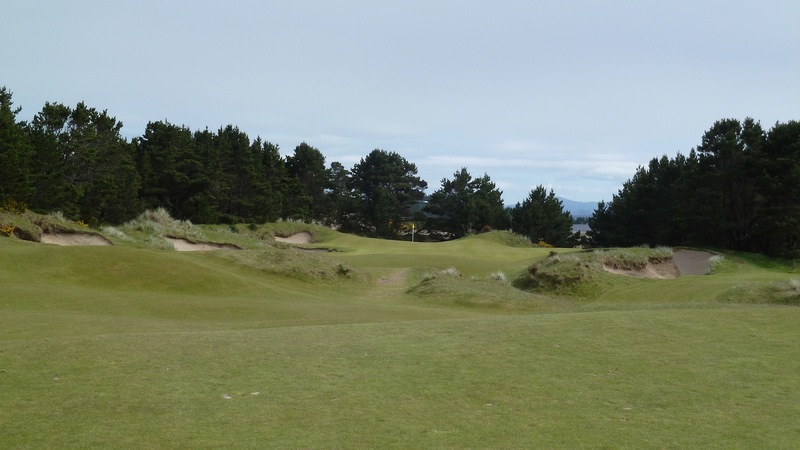 The bunkers, like all the bunkers at Pacific Dunes, can be very difficult. This short par 4 is a fun hole and can be drivable for those who hit driver. A shot that starts out over the right bunker and draws back to the left will have a chance of hitting the green. 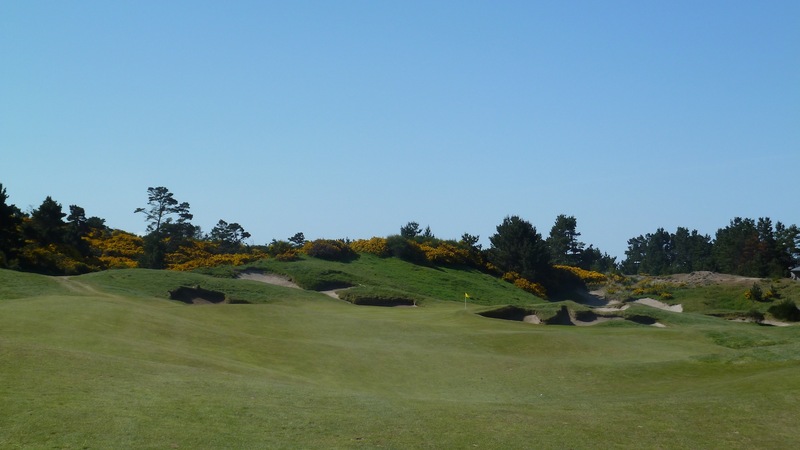 Lay up shots need to be very careful not to get into the bunkers on the left side. They are very deep and make hitting the green with the second shot difficult. Here is a view from the bunkers on the left side . . . not an easy shot. Sorry about the sun glare on this one. This hole is another one that looks long on the scorecard but will be impacted by what the wind is doing. The only real trouble on the drive is hitting a slice that goes too far right and is blocked out from reaching the green. A view of the approach into the green. 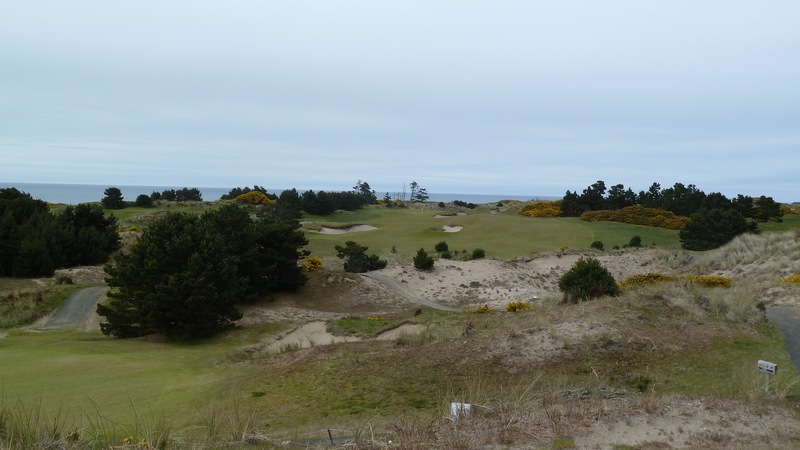 This is a good example of Pacific Dunes’ scraggly and unkempt look. 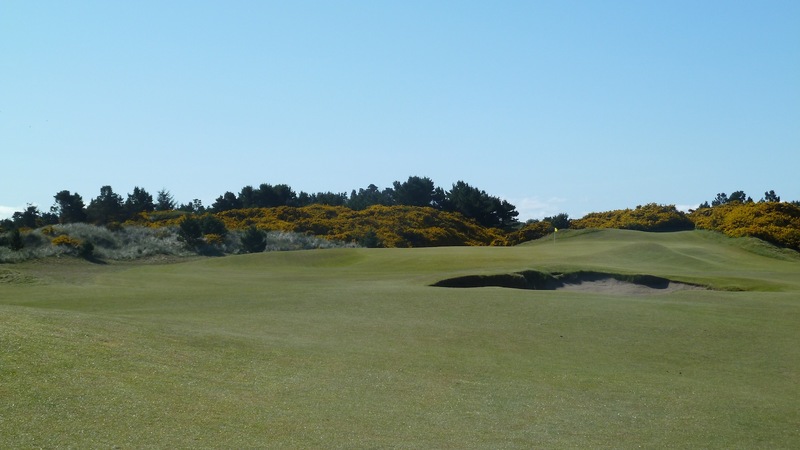 This par 4 hole bends a little bit to the right and the ideal position is the left side of the fairway. The cluster of trees on the right are in play off the tee. The view into the green. The drive on this hole is to a blind landing area. The recommended line is right over the stairs directly in front of the tee box. Here is a look at the approach into the green. Now is where things get interesting. Tom Doak broke the mold on the back nine and he did so by starting with two consecutive par 3s. 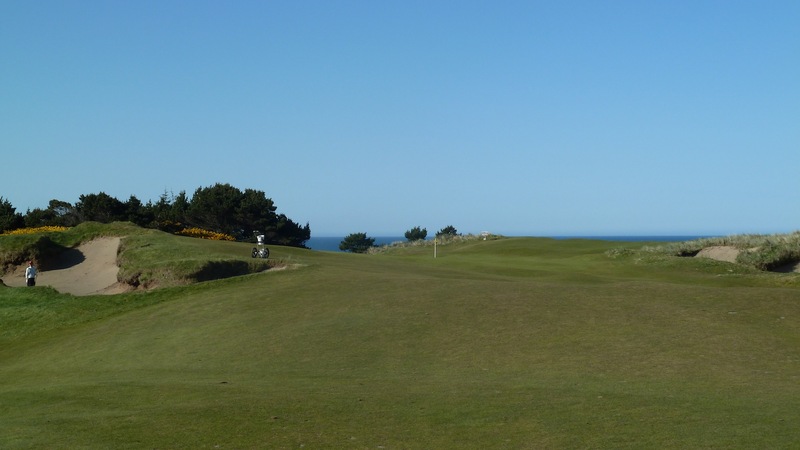 The first is a beautiful hole with a tee shot down towards the sea. There are two tee boxes for this hole, but all four times I have played it the upper has been used. 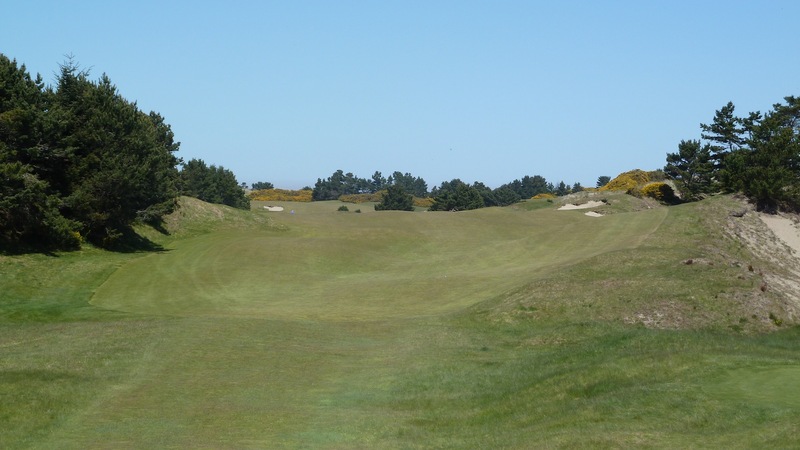 This short little one shot hole is one of the iconic holes at Bandon Dunes. 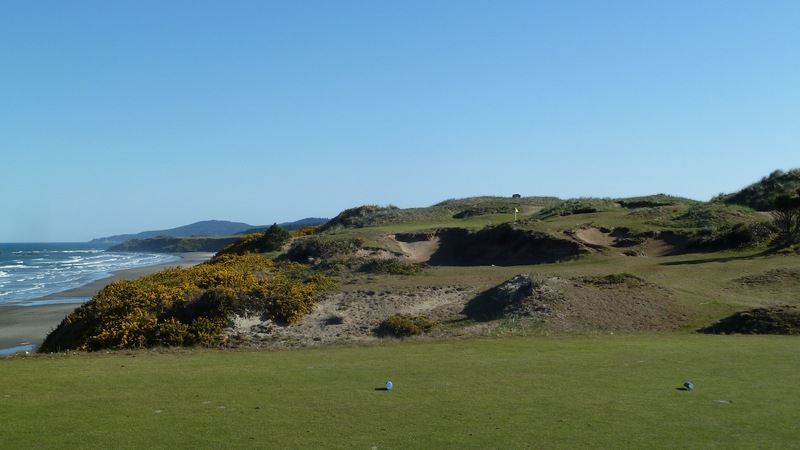 The blowout bunkers are a bit of a signature for Pacific Dunes. What a great looking hole. This par 5 is going to be very reachable in two with a helping wind. The flag is the one tucked off to the left and not the one straight ahead. 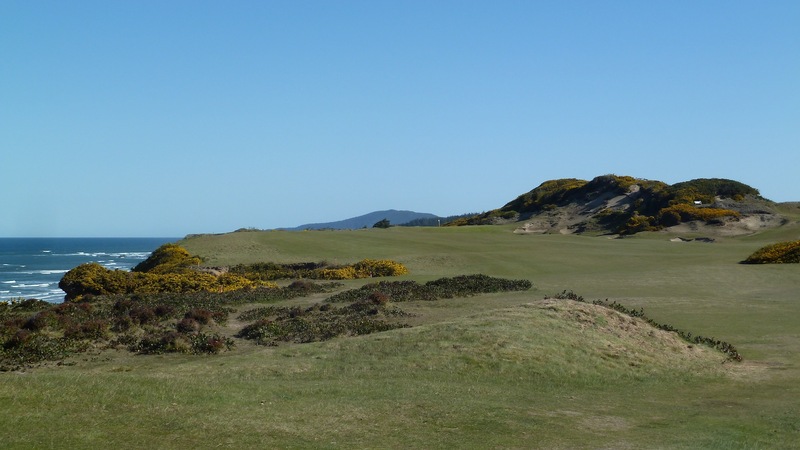 The bunker on the right side is in play off the tee. This is not the ideal angle to approach the green, but anything that carries the bunker should roll down to the putting surface. 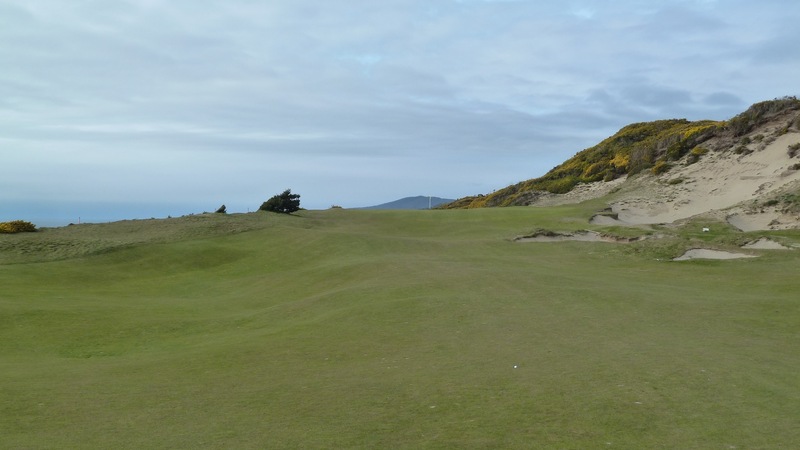 This is one of my favorite holes on Pacific Dunes. 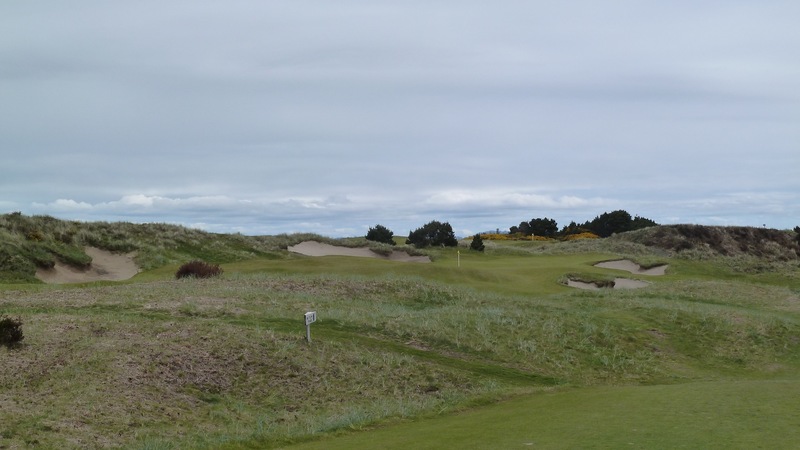 I love the huge bunkers on the side of the dunes on the right. 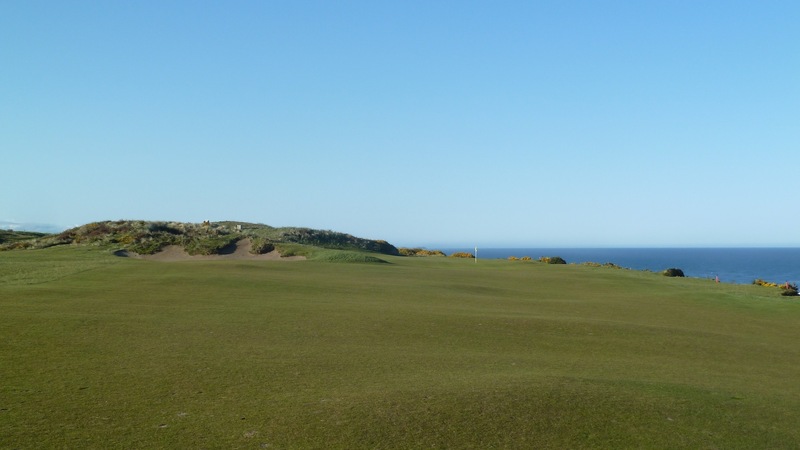 This is another of the seaside holes where there is a little more fairway on the cliff side than there appears. 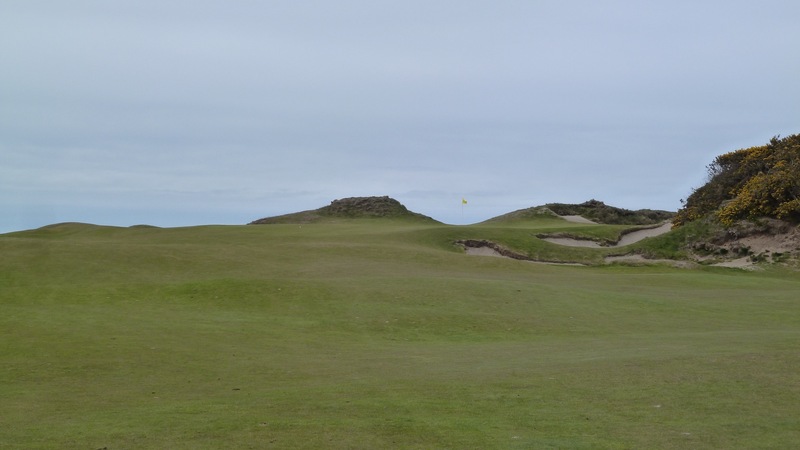 Playing this hole into a howling wind can change the club selection from a pitching wedge to a 5 iron. Note the bunkers on each side of the green. In both my rounds someone in our group ping ponged back and forth between them before finally picking up. Here is a little closer view of the green. 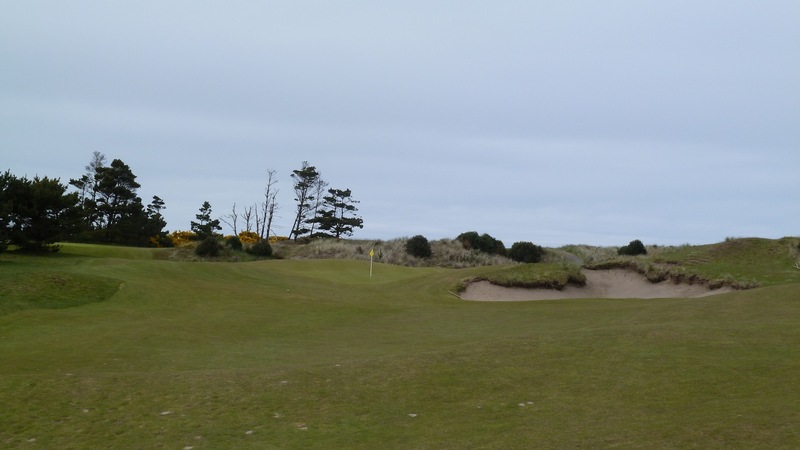 The second of three par 5s on the back side, this one is again very reachable when there is a favorable wind and nearly impossible with a hurting wind. The fairway is wide and inviting so grip it and rip it here. A view of the approach into the green and the bunker that sits a 10-15 yards away from the putting surface. This is a short hole so make sure to pay attention on club selection. The hole doglegs right and too much club off the tee can be a costly error. 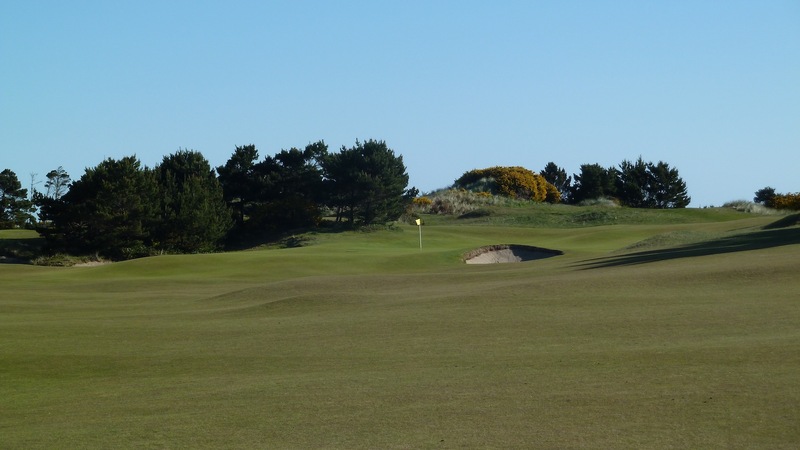 Note that there are no bunkers in front of this green which allows for low running shots – one of the hallmarks of true links golf. The final one shot hole of the round is also the longest. The safe play is to hit the tee shot somewhere on the right side of the green. Its likely that it will roll down towards the middle and it takes the very deep bunkers on the left out of play. There is actually room to land a ball to the right of the right bunker. The final hole brings us to the end with a nice three shot hole. 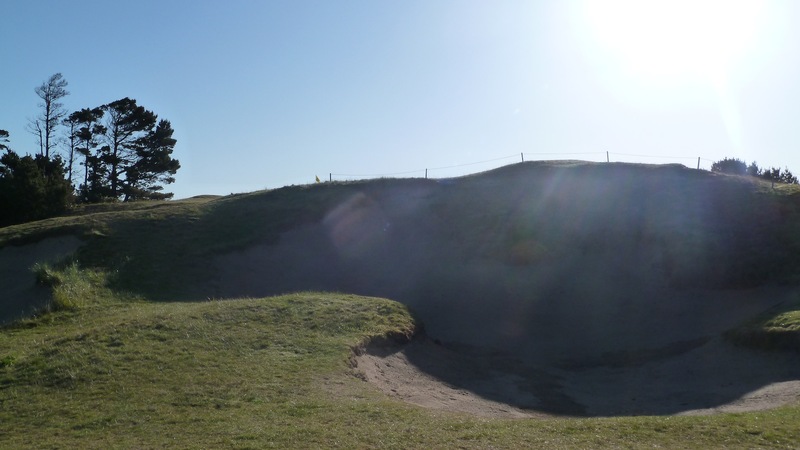 Beware the bunkers on the left off the tee. A driver is not a necessity here. A view of the approach into the green. 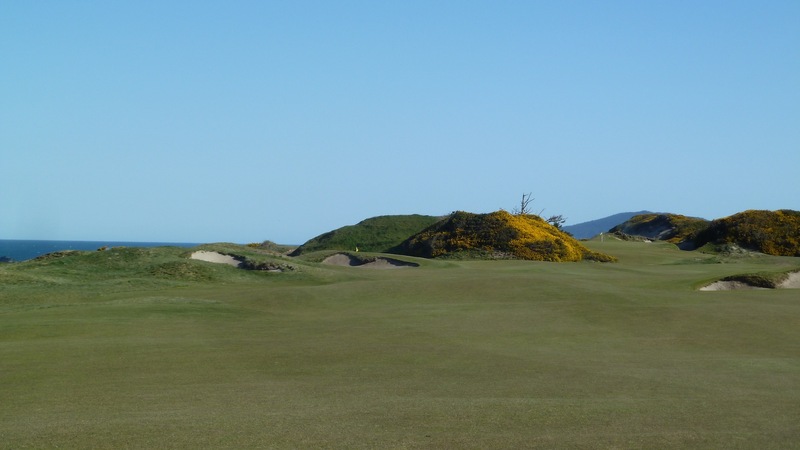 Yes, the bunkers are as menacing as they look. Here is another view of the green from another angle. 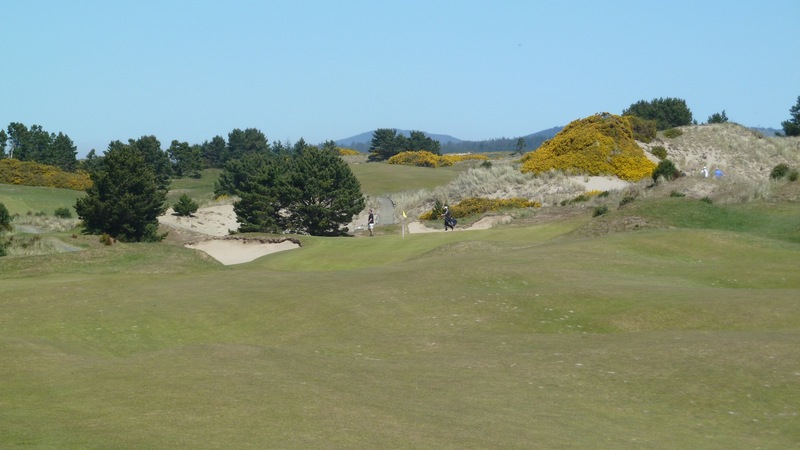 It’s hard to call out any specific holes on Pacific Dunes because they are all so good. 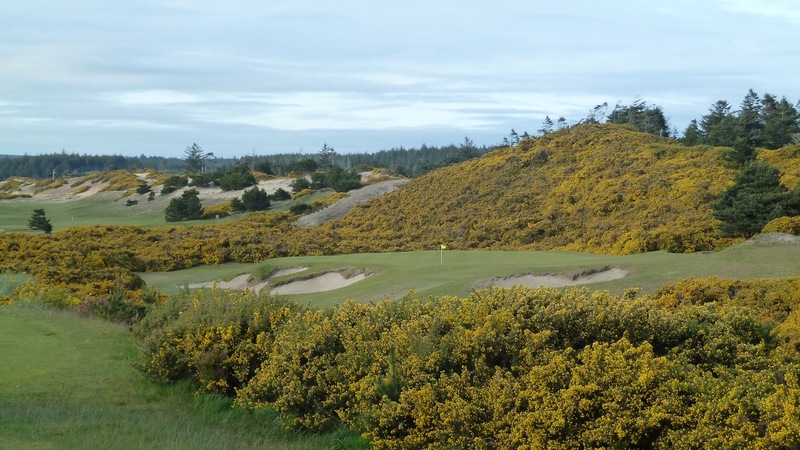 Dramatic water views from high atop the cliffs, rugged natural terrain, authentic links golf and good old fashioned wind make Pacific Dunes a golf experience that is not to be missed. 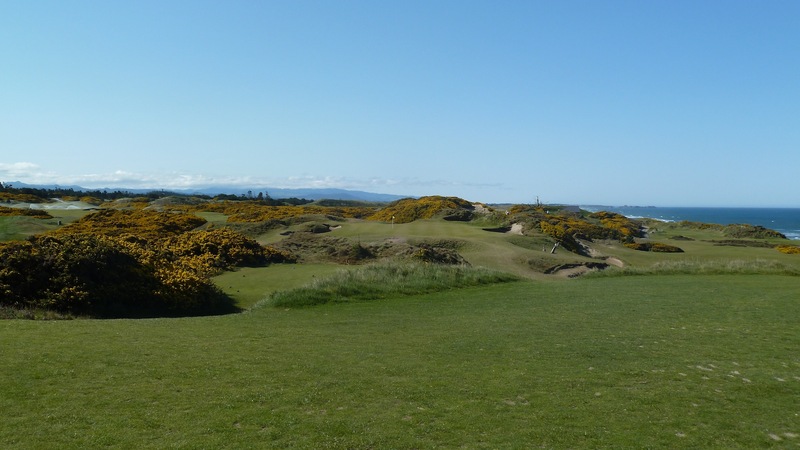 The course is strategic, fun and beautiful which makes for great golf in my opinion. 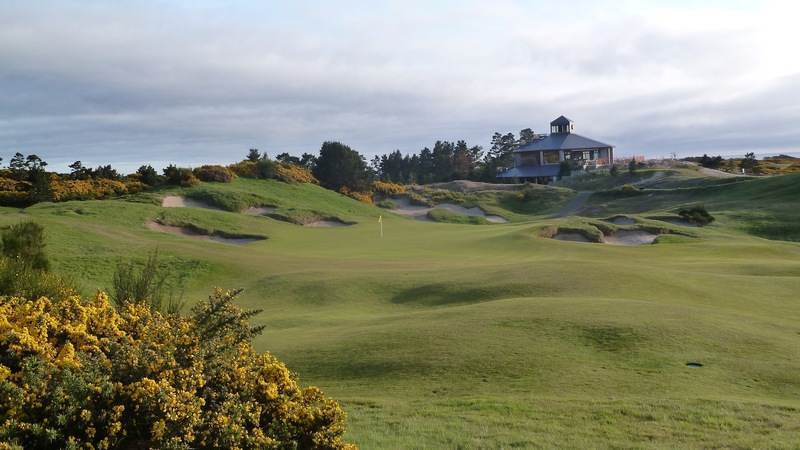 Pacific Dunes is the course that really broke Tom Doak out as a world class architect and Mike Keiser made a bold move by trusting him with this incredible piece of property. 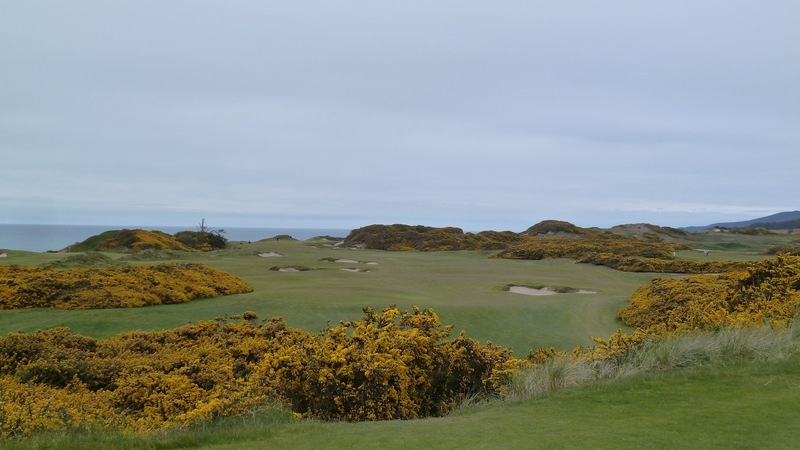 The end result is a golf course with a reputation as one of the absolute bests and that holds it own with top rated private clubs – the reputation well deserved in my opinion. 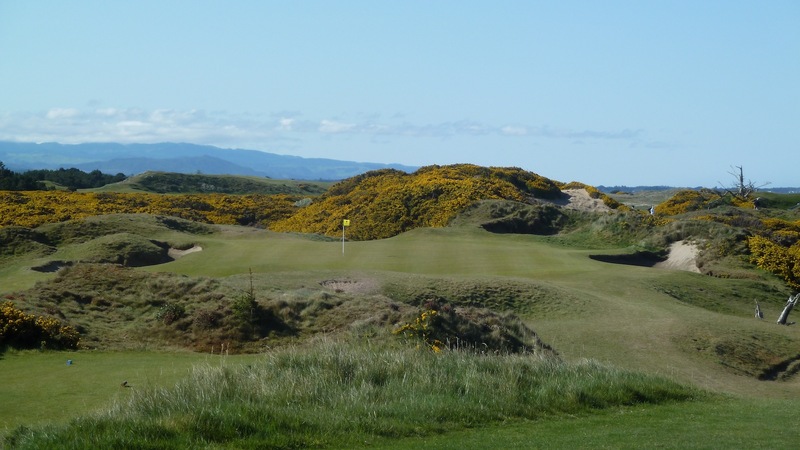 There is no way anyone who loves golf courses should miss seeing this masterpiece. 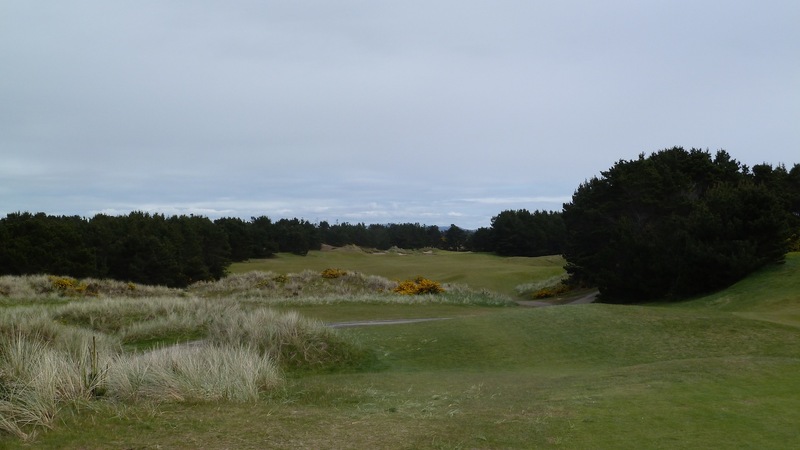 Was there the week before you and loved this course even though we were playing into gale force winds haha. We hit 5 irons where we would normally hit wedges and still came up short but I guess that’s part of the experience. The holes with the wind were a blast though. 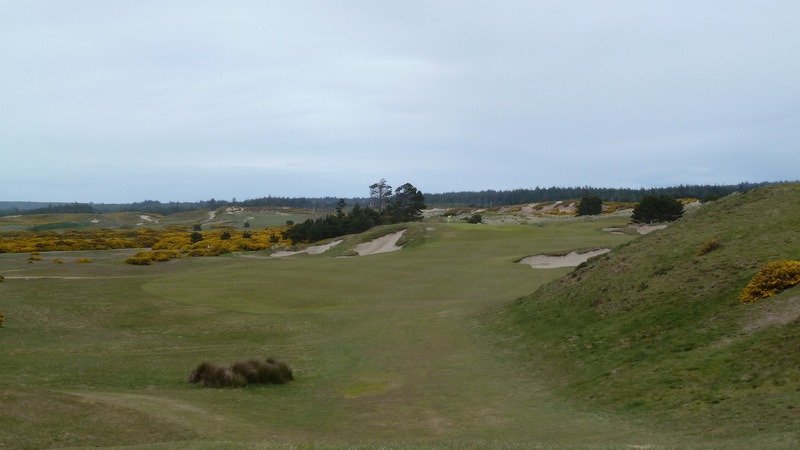 I have to say that Bandon Trails was very underrated and I really enjoyed that course. Sam I had the same experience in 2010 except we had torrential rain along with the winds. This trip our afternoon rounds were typically blowing a good 20+ mph. The morning rounds didn’t have a whisper of wind. 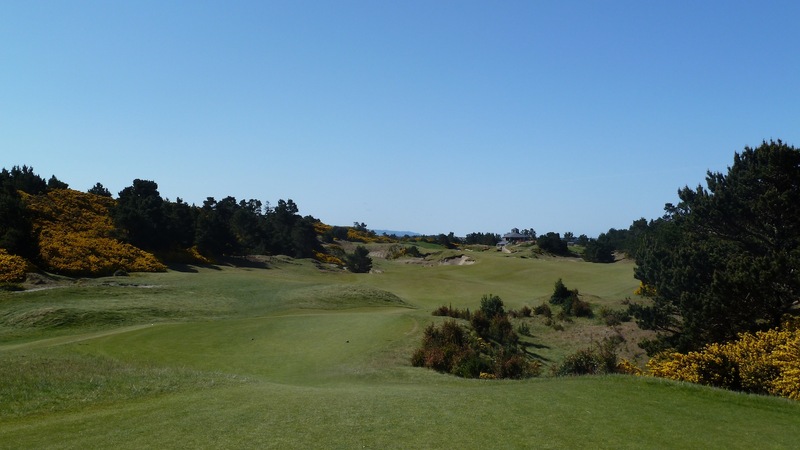 This time I had about as perfect as the weather can get at Bandon Dunes. 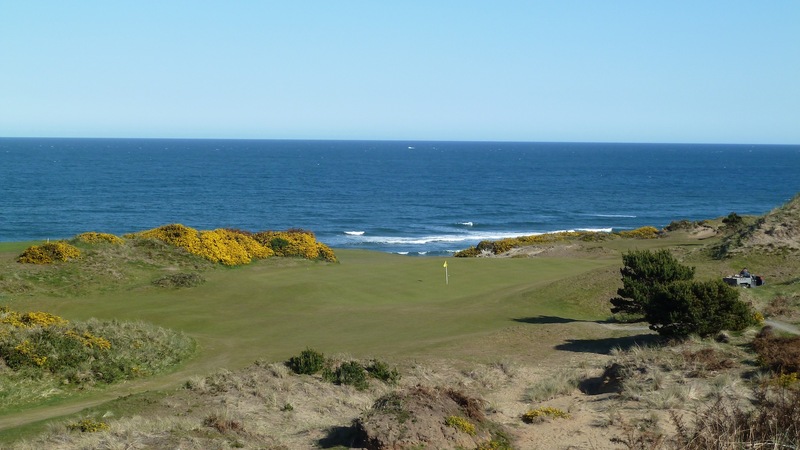 I am heading out there in a month w 3 other friends and have been stalking these write ups on all the courses. Awesome pictures and can’t wait to see all these holes in person!! !